Honestly speaking, ABIT is far from the best motherboard manufacturer worldwide. While they have had some successes in the past, such as the IT5H, AX5 (later revisions), BX6, and the ever popular BH6, they have never been known for their outstanding stability. We've always left stability up to the bigger names in the industry, the ASUSes, the AOpens, and the Tyans. While there have been numerous pleasant experiences shared by overclockers and tweakers alike with ABIT motherboards, ask any vendor that carries their motherboards alongside a line from ASUS or AOpen and they will tell you that the RMA rate on ABIT motherboards overall is much greater. There was a sigh of relief last year when ABIT announced that they weren't going to dive into the Athlon motherboard market just yet With the number of problems that Gigabyte, Microstar and FIC were having with producing Athlon motherboards, chances are that we wouldn't have seen a product of stellar quality had one been released back then. So ABIT, along with the rest of the motherboard industry waited around for the perfect time (if one was ever to pop up) to produce an Athlon motherboard. And like the rest of the motherboard industry, the announcement of VIA's KX133 chipset marked the beginning of ABIT's interest in the Athlon market. One of the major concerns ABIT had toward producing an Athlon motherboard was that they did not feel that they could maintain high enough profit margins while producing a motherboard based on a 6-layer PCB design. ABIT's entire motherboard line is based upon 4-layer PCB designs, which are more cost effective and easier to produce than the more expensive and potentially more reliable 6-layer designs, so asking them to move to a 6-layer design in order to support what was, at the time, an unproven processor platform was absurd. VIA's reference KX133 design however, was built upon a 4-layer PCB; combine that with the incredible popularity of the AMD Athlon platform and ABIT had no reason to stay away from the Slot-A speed demon any longer. We still had our reservations about an ABIT-made Athlon motherboard, but from what we could gather from VIA at last year's Fall Comdex in Las Vegas, they were going to great extents by helping motherboard manufacturers with their specific KX133 designs in order to ensure that the first batch of KX133 motherboards that hit the streets were as problem free as possible. In spite of that, seeing is believing, thus we held off on judgement on the ABIT KA7 until actually getting one in the lab to test. Well, our chance to put ABIT's first Athlon entry to the test came just recently, and to our surprise, the KA7 faired much better than just about any other ABIT board we've ever tested. The KA7 is a cross between the reference design that the K7V and AK72 were based on and ABIT's own BE6 layout. Because of this, the KA7 is built upon a PCB that is larger than that of the EPoX 7KXA and the Tyan Trinity K7 but smaller than the ASUS K7V and AOpen AK72 by about 1/2" (1.3 cm) deep. This unique layout combination was necessary in order to outfit the KA7 with everything that ABIT had planned for their first Athlon motherboard. It was very obvious that ABIT attempted to make the KA7 for the Athlon market what the BX6 was for the initial wave of BX motherboards. There are silk screens on the KA7 for an additional High Point controller and two more EIDE ports for a special version of the KA7 that will boast ATA-100 support in addition to the Ultra ATA 33/66 support provided by the 686A South Bridge. As we mentioned in the introduction of the review, the KA7 is based on the VIA KX133 chipset. For those of you that aren't familiar with the Athlon chipset evolution, the KX133 chipset from VIA is the second official Athlon chipset that ever made it to mass production, and it's replacing the first ever Athlon chipset, AMD's own 750. 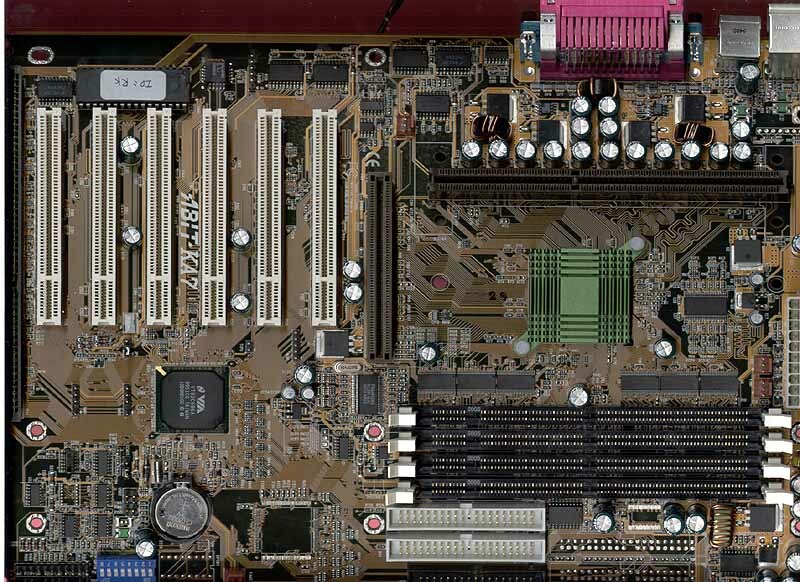 The KX133 improves upon the AMD 750 design by integrating VIA's 133MHz DRAM and AGP 4X controllers into the 371 North Bridge of the chipset (these two features are essentially borrowed from VIA's Apollo Pro 133A North Bridge). 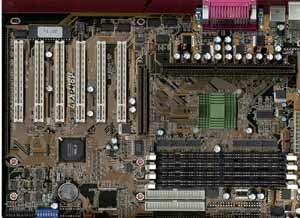 By supporting a 133MHz memory bus frequency while the FSB frequency of the motherboard still runs at 100MHz DDR, VIA gives the Athlon an extra 33% of available peak memory bandwidth, which comes in handy in the more memory intensive situations such as professional level 3D rendering/CAD/MCAD applications. The AGP 4X support of the KX133 chipset doesn't improve performance all that much over the previous AGP 2X implementation on the AMD 750 chipset, but it's a marketing feature that must be supported in order for a product to look good on paper. The main feature the KX133 chipset offers is its support for PC133/VC133 SDRAM, which, although doesn't help performance tremendously in your everyday home office applications, it can come in handy in games but especially, as we mentioned above, in professional environments where memory performance is critical to application speed.